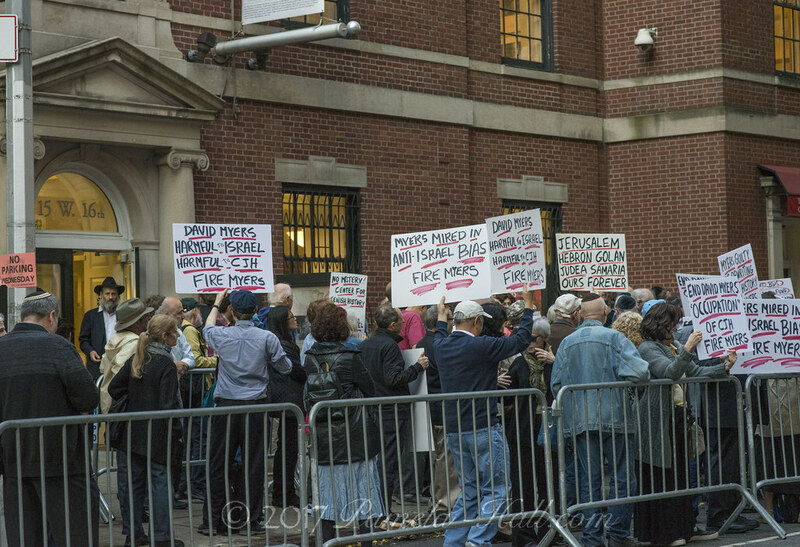 Read more to see how these demonstrators defended Israel from the enemy within. Over 200 people assembled in front of the stage set up on West 16th Street to hear speeches from AFSI’s Co-Executive Directors, Helen Freedman, Judy Freedman Kadish, JCCWatch.org President Richard Allen, ZOA’s Liz Berney, AFSI’s Charlie Bernhaut, Concerned Citizen’s Stewart Cahn, and Yom HaShoah Committee Chair Lynn Bursky-Tammam, along with rocking music by the trio of brothers, Pey Dalid. We, the people, the grassroots, are here to speak up for TRUTH. Enough of the lies and falsehoods. Enough of the revisionist history. 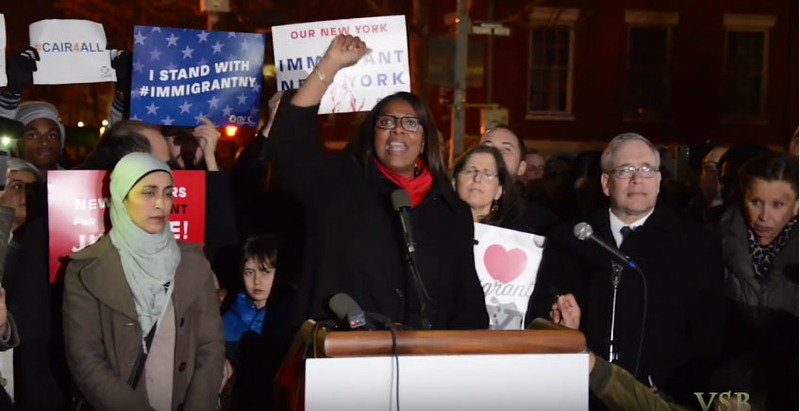 The time is NOW, as we stand before the Center of Jewish History — the home of five esteemed institutions – that has allowed itself to be trapped in a quagmire. 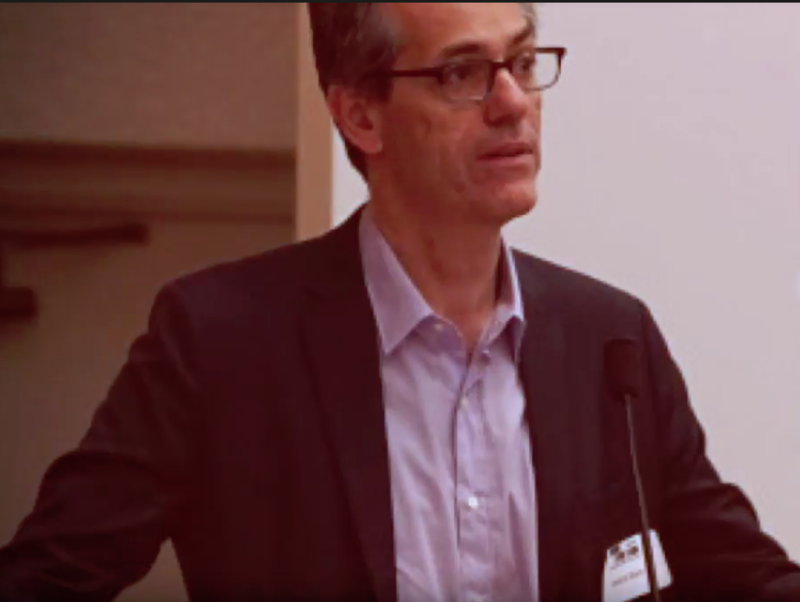 With David Myers as CEO and President of the Center, it becomes the Center of Revised Jewish History, with the Jewish story, the Jewish entitlement — biblical, historic, and legal, lost in the fictions and distortions that he brings with him. There is no other people that has always made Jerusalem its central core. In the midst of the joy of the Jewish wedding, the glass is shattered, reminding us of our connection to Yerushalayim. 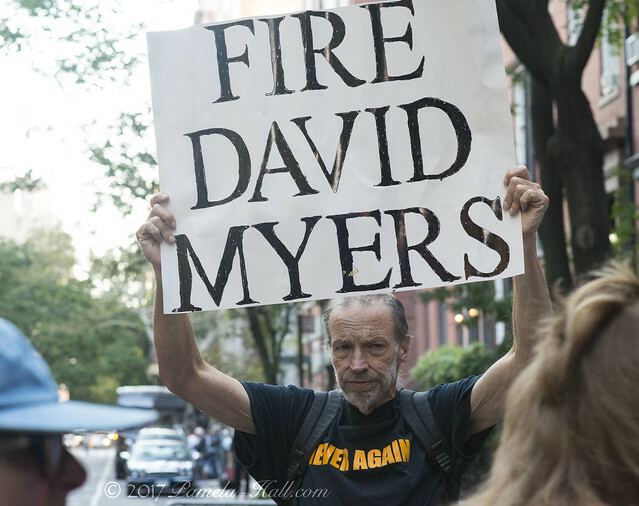 Has David Myers been to the “settlements” in Judea and Samaria? Has he ever been on a trip such as an AFSI Chizuk mission, where we climb the hills of Itamar, Yitzhar, Kedumim, Elon Moreh, Shilo, Eli, and on and on? Has he met the people and seen their homes, schools, work places? If he has, then he knows there is no “occupation” and these are the biblical holy places, and NOT the West Bank. If not, then he must visit them before he condemns them. 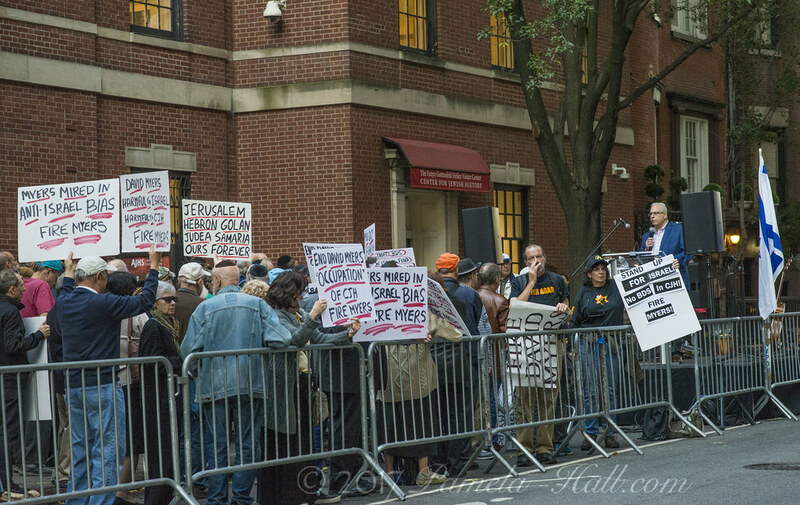 Joining the protest hosted by AFSI and JCC Watch were the peaceful supporters from the New JDL-NY. 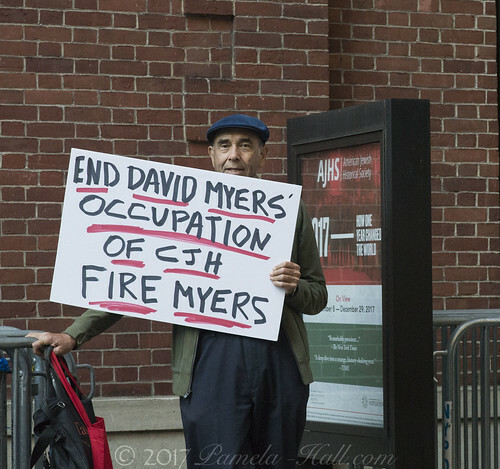 All were there to support the State of Israel and to peacefully protest the egregious hiring of David Myers as CEO for the CJH. It is an outrage. 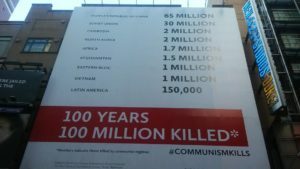 We have to change the trajectory — anti-Israel propaganda against Israel cannot be tolerated – especially in an institution named THE CENTER FOR JEWISH HISTORY. The time is NOW!! 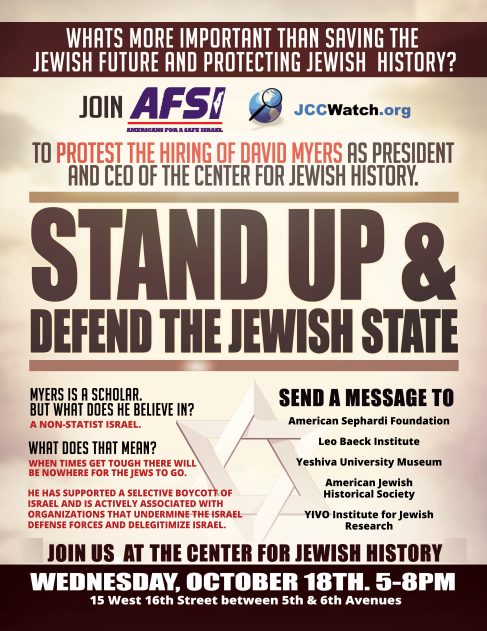 We denounce the evil of such teachings and plead with the Center of Jewish History to purge itself of this infection in its midst — FIRE MYERS — FIRE MYERS — FIRE MYERS!! This entry was posted on October 21, 2017 at 9:53 AM and is filed under News. You can follow any responses to this entry through the RSS 2.0 feed. I really like this site because it brings a lot of relevant information to our knowledge.